the apartment is no ordinar design agency. their contact to the outside is very important to them. not only their office in manhattan with huge windows and an impressive design, but also their website (+broadcast) draws interest not only because it is totaly different to other offices or websites. every once in a while there are different actions at their big windows. once while i was in new york i was able to see one action by myself. during the project of illegalart.org they put the whole windows full of post-its and within a few minutes passersby scribbled over them completely. here you can see pictures. 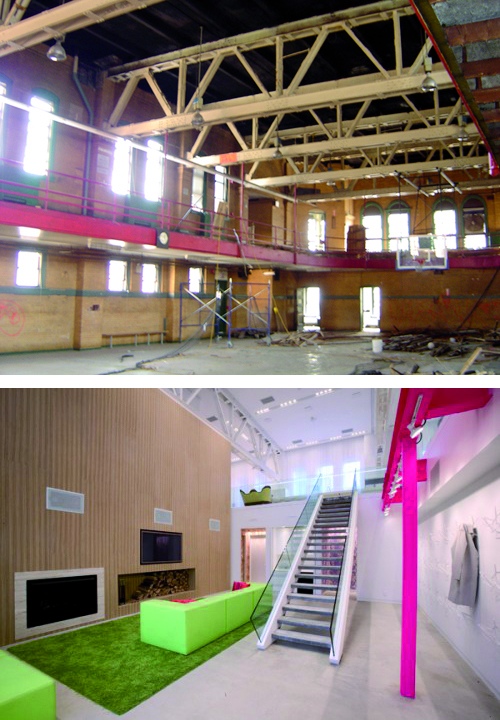 an other reason why i like the apartment is their project, where they converted an old ymca-gym in new york into an unbelievable private residential building. with the help of fantastic ideas and nice details they builded up an unique object. for me this is a real proof of good taste. here you can find more pictures. and also the whole project on pdf-file. dinner at the apartment | roitsch. Star Wars (on a notebook) | roitsch. Wooster Collective Talk | roitsch. dinner at the apartment | better taste than sorry.